The European “discovery” and settlement of the New World had a profound impact on civilization in many ways, some of which are not as well-known as others. For instance, did you realize corn, tobacco and the tomato were native to the Americas – and therefore unknown to the rest of the world? Corn is now the world’s most important food crop. Italian and a lot of other Mediterranean cuisine depends on the tomato. How did the whole Roman empire come and go on the Italian peninsula without tomato sauce on pizza or pasta? Crazy! What, then, exactly did they eat in Rome? As a lover of Italian food over all other kinds, I am glad the world now has tomatoes. Tobacco on the other hand, is arguably a plant people could have done without. 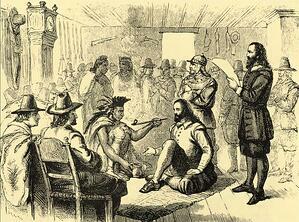 Tobacco did make some positive contributions to humankind, particularly to pre-Columbian America where it had spiritual usage and meaning and even played a role in diplomacy (think of smoking the “peace pipe”). Tobacco leaves were even used as money by some native cultures – and by settlers in Virginia and North Carolina in the 17th century. Tobacco as money seems like an upgrade given my view of the ills of government fiat money! However, many understandably cite the plant’s negative impact on human health, especially since mass production and distribution of cigarettes began following James Bonsack’s invention of the cigarette-rolling machine in 1883. This innovation enabled the production of 200 cigarettes per minute, roughly 200 times the amount that could be rolled by hand. The lower production costs and the marketing prowess of James B. Duke’s American Tobacco Company helped cigarette smoking become near ubiquitous in the United States in the first half of the twentieth century. Certainly selling an addictive product was a key facet of the success of the industry. Tobacco companies, especially American Tobacco and Mr. Duke made a lot of money. With some of that money, Mr. Duke established an endowment at Trinity College in Durham, North Carolina that was so large that in order to honor it the school changed its name to Duke University. American Tobacco and the offshoots from its anti-trust driven dissolution, R.J. Reynolds, Ligget & Myers and Lorillard were amongst the best performing investments for a very long time. Not for just one or two decades, but since at least the turn of the last century to the present. Our philosophy is to view investments on their merits without our own bias on “socially responsible investing.” There are many sectors that arguably create socially undesirable outcomes and we do not believe it is right for us to be the ones making that determination on behalf of all of our clients. Still though, we are happy to customize our investments to accommodate clients who have a different view in general or on specific sectors. Investing in tobacco companies has been exceptionally lucrative – even in the face of declining cigarette consumption. 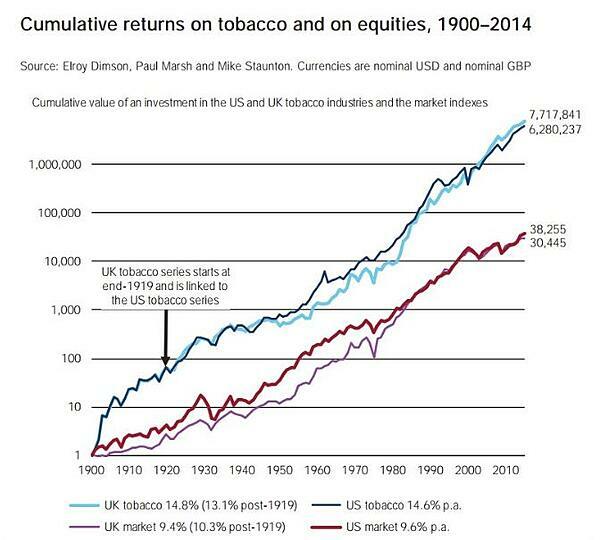 Since the turn of the century the number of smokers worldwide (excluding China) has declined over 25% yet an equally weighted total return index of Altria Group Inc. (MO) and British American Tobacco PLC (BATS.LN), the two companies for which pricing data is available, has appreciated more than 25 times. Just recently, however, tobacco equities have underperformed the market by a relatively large amount. Skeptics cite with conviction issues such as regulatory risk, uncertain and declining demand, and disappointment in new product sales and profitability. Many of these negatives are real but must be viewed in their proper context. Early in my career, I worked for a long/short commodity hedge fund and recall listening to and reading several seemingly convincing negative reports about tobacco companies coming from “short” investors. These investors were betting that the price of the tobacco stocks would decline. To summarize the thesis of those negative reports: legal and regulatory risk, declining demand, and lack of product innovation. Essentially, they are what we think are the same reasons behind the underperformance today. These shorts were primarily correct on all these things. Their analysis was sound; however, the stocks did not underperform. Far from it, those with short positions had to cover long ago or face ruin. Why? Because despite these negatives, tobacco companies have continued to grow earnings (albeit with some volatility) and have returned those earnings to shareholders in ever larger amounts. 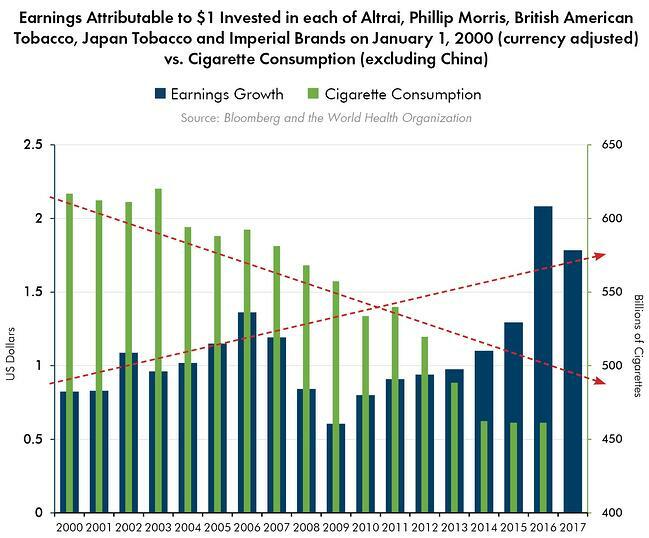 For example, the chart below demonstrates how the largest tobacco companies in the world have grown earnings in the face of declining smoking over the past 18 years. We think it’s quite likely that the trend of falling consumption will continue. It is also not too demanding to envision a world where regulatory pressure will remain. New products may provide decent but not spectacular returns. Nonetheless, we believe that the stocks are good investments. Why? Because the valuation is compelling. The cigarette business has often been called a “cash cow.” It needs limited new capital and still generates a lot of cash. This cash flow enables tobacco companies to experiment with developing new, healthier smoking products (known in industry jargon as Reduced Risk Products or RRPs) and still have a lot left over. We believe tobacco companies have been very disciplined with how they use that cash. They have returned a large portion of this cash to their shareholders as dividends that we believe are sustainable. Most tobacco stocks have payout ratios (the amount of earnings that go towards dividend payments) at very sustainable levels, averaging 75% for the past ten years for Phillip Morris (PM), Altria (MO), British American Tobacco (BAT.LN), Japan Tobacco (2914.JT) and Imperial Brands (IMB.LN). We believe that this low payout ratio will enable the dividends to be sustained, and in fact, possibly even continue to grow. Accordingly, we believe that the depressed prices at which many of the shares trade represent good value, with dividend yields averaging 5.25% for the companies listed above as of this writing. However, these companies also return substantial cash to their shareholders in the form of share buybacks. 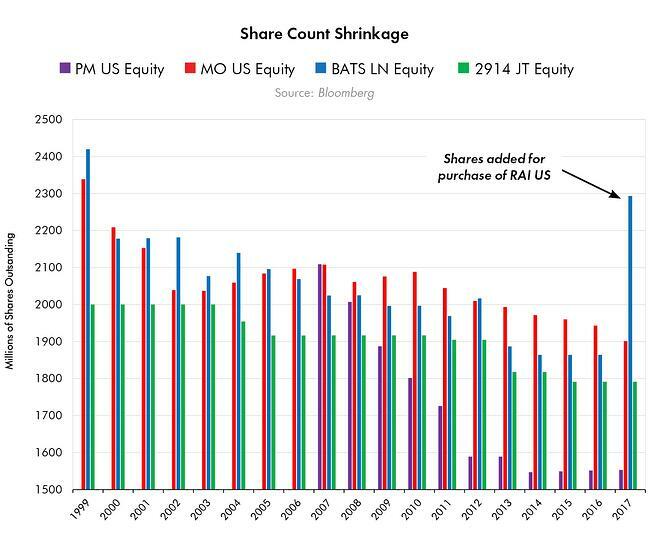 Share buybacks help to lower the number of shares outstanding, which gives each remaining share of stock a larger claim on the company’s earnings and assets. This can be a strong means by which shares grow in value over time – even if revenue simply remains constant. Do not underestimate how powerful this can be to help compound wealth over time. We certainly don’t. Our point is that even with no growth or negative growth in revenue, we believe that strong cash flow can, for many tobacco shares, still drive earnings growth. More important perhaps, is that after this most recent period of underperformance, we believe that the stocks are trading at very low valuations. The price to earnings ratios of the domestic tobacco companies are as low relative to the market as we have seen since the financial crisis. So, even without any revenue growth or even earnings growth we believe these stocks may be good investments. Their low price to earnings, price to book ratios, and healthy dividend yields, make them attractive particularly in a market with a P/E ratio of 21, a dividend yield of 1.9% and earnings growth expectations that may be unrealistic. Smoking tobacco has a long tradition in the Western Hemisphere. However, in the developed world and even in many parts of the developing world we have seen lower rates of smoking consistently for many decades. This has impacted the tobacco industry negatively but has not prevented it from continuing to generate very substantial gains for investors just as it has since its inception. With renewed recent focus on the negatives to the companies in the sector and thus underperformance of the shares, it reminds us that patience and buying at the right price are often more important than the market’s fickle growth expectations. Growth can alleviate mistakes of buying at too high valuations but cash flow, low valuation and patience can also alleviate slow growth and controversy.